Quick and easy, this simple but very effective crochet purse pattern requires no sewing up as the edges are crocheted together. Leave it plain or add an edging and a motif as shown in the photograph. It is made in a double thickness of yarn with a relatively small hook for the thickness to give tightness, body and strength. 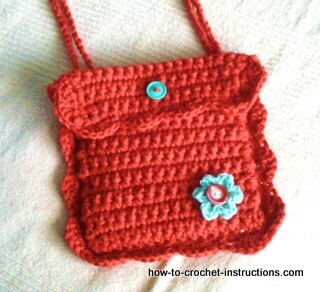 Do note that you will need quite strong fingers to make this crochet purse as the resulting fabric is fairly thick. For embellished option (as shown in the photo)you will also need to know how to work double crochet (UK trebles) and slip stitch. About 100g, maybe a little more, of acrylic aran weight or worsted yarn. Allow more for heavier yarns such as wool or cotton. One button for fastening. choose this button after you have made the item so you can check that it fits through the crochet fabric. For the embellished option you will also need a matching button and contrast yarn. Also the button you choose for the fastening should match the contrast yarn. Repeat row 2 until you have worked 45 rows in total. Do not work the ch at the end of the last row. fasten off one strand of the yarn. Continue working with 1 strand of yarn and a 5mm hook. Working down the side edge of the piece make 9 sc over the first 9 rows. Fold the bottom edge up to where you have just finished the 9 sc. Continue working through both layers of the fabric, joining them together with 18 sc down remaining length of the side edge. Work 1 sc into corner. Work 27 sts up second side edge to match the first side, joining the double layer as before. Work another row of sc all around purse working 3 sc into each of the corner stitches. For the basic purse, fasten off and go straight to the instructions for the shoulder strap. If you have more advanced crochet skills you can add a fringe, embellishments, or an edging. If you would like a pretty shell edge for your crochet purse follow these instructions carefully. It would be best to print them off then tick off each stage as you go along so you don't lose your place. Make 1 sc into first st.
You should now have come round full circle and reached the beginning of the shell st row. Fold down the flap and on the back of the bag very near the top and close to the edge (or where the edging meets the side if you have done one) insert your hook into the fabric and pull the yarn through, then pull the yarn through both loops on hook. Insert the hook again into the crochet fabric next to where you first joined onto the bag. Pull yarn through. Pull yarn through both loops on hook. fasten off. Repeat this on the other side of the bag, but before you make your second insertion into the bag's fabric, pass the whole hook + ball of yarn through the first long chain loop. This will cause the 2 long loops of chain to hook together. That is your crochet purse finished!